A paradise place with wild beaches, crystal clear water and fine white sand awaits you: the Cíes Islands. Within the national park Parque Nacional de las Illas Atlánticas lies this island group consisting of the three islands Monte Agudo, O Faro and San Martiño. The first two are connected by an impressive sandy beach of more than 1 km (Playa de Rodas). 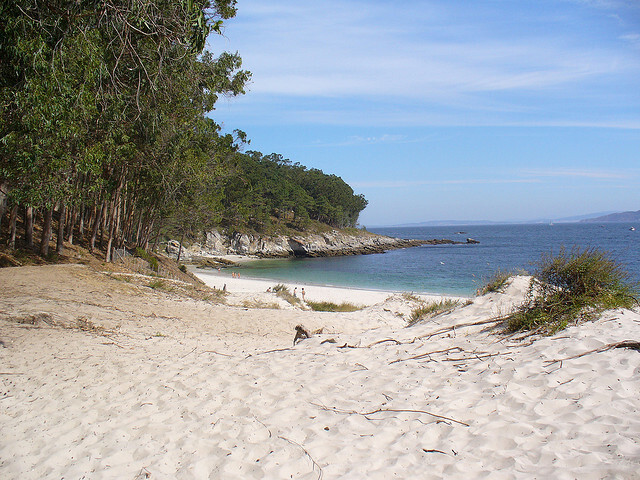 Nudist lovers can enjoy the beach of `Figueiras´. 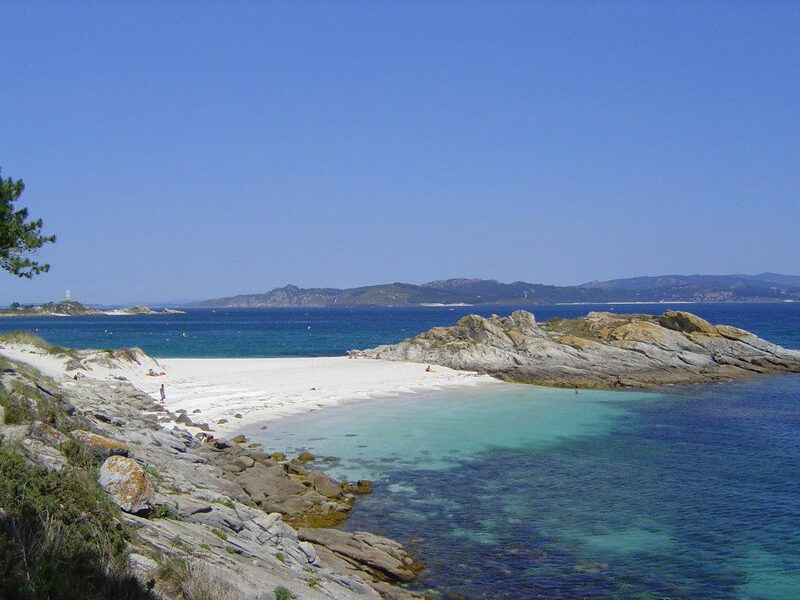 `Mar de Ons´ has created a map with 9 beaches in the area of `Cies’. The ferries only run during the Easter week, on the May weekends and in the summer. They depart from Cangas, Vigo and Bayonne. Here you can find timetables and prices of some shipping companies, which take the approximately 40 minute crossing: Mar de Ons o Nabia naviera. The ferries take you to the islands ‘Isla del Faro’ and ‘Isla Monte Agudo’, ‘San Martiño’ is only accessible by private boat. Under this link vigoturismo.org you can find various boat companies, which rent private boats in `Vigo’. You only need to have an anchor approval. In private boat you can visit the islands throughout the year. The entire area with its impressive seabed is ideal for diving lovers. Various locations in the vicinity offer diving equipment such as ciesub or altadis., for example. This romantic butique hotel is situated in the middle of beautiful Galician countryside, surrounded by the `Val de Miñor´. In a 16th century manor house with enchanting gardens and ancient trees, on a 20,000 m² estate. Several resting areas in the garden invite you to relax. Let yourself be enchanted by the eclectic hotel decoration, with furniture from various countries of the world such as China or Morocco, and immerse yourself in an elegant, stately and comfortable environment. 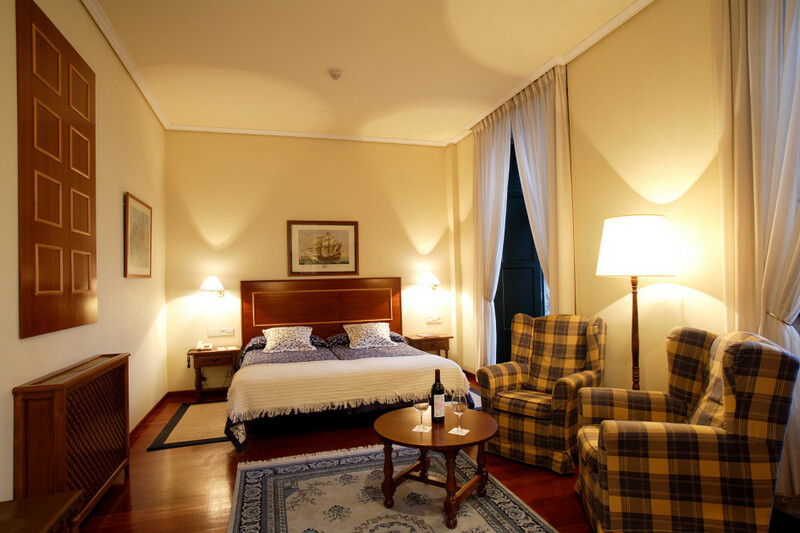 The 9 spacious hotel rooms are furnished in the same style, there is a wonderful suite ideal for romantic getaways. Very close to the bay of `Baiona´ with the beaches of `Américas´ and `Ladeira´, from which you can take a ferry to the most beautiful Cíes Islands. 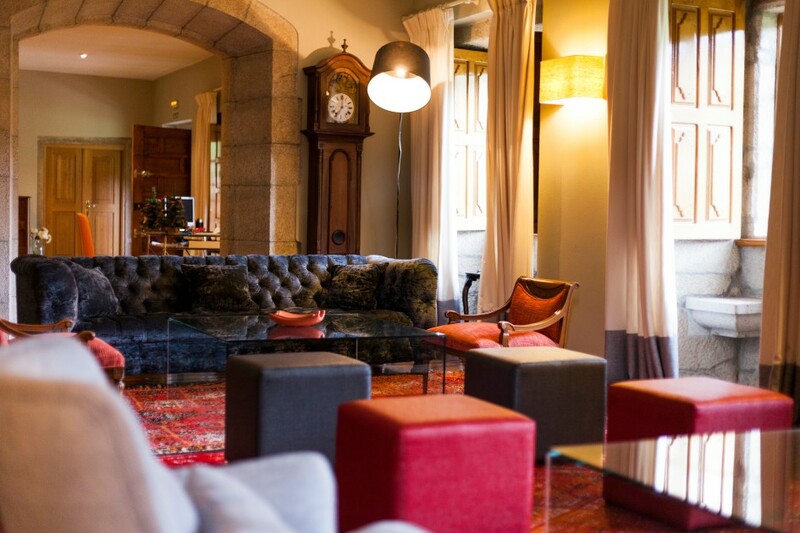 Book now your dream hotel Pazo da Touza. Opened in 2010, `Nagari´ luxury hotel is a truly impressive accommodation of the extra class, where its guest are pampered with a variety of amenities and services. 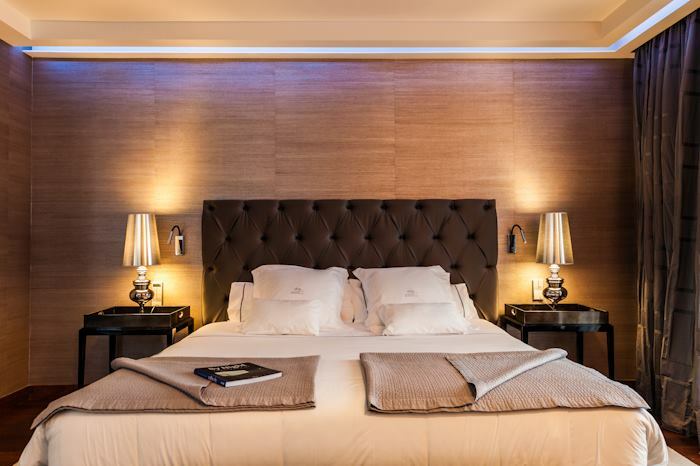 This boutique hotel is characterized by a blend of classic and traditional interior design with an elegant, avant-garde atmosphere. The impressive suites all have hydromassage bathtubs with private lounge, terrace and romantic fireplace. 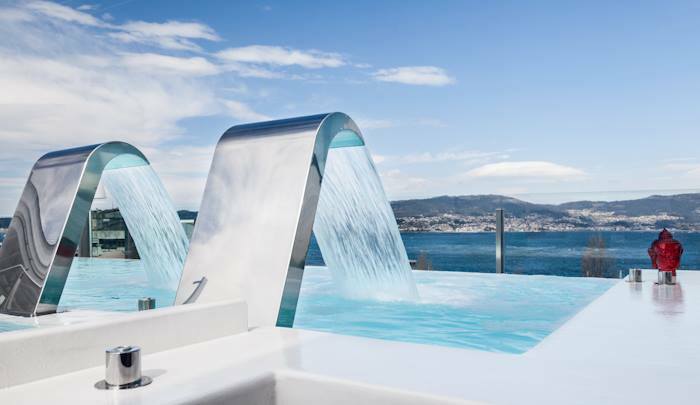 Spread over two floors (1st floor and attic), there is an enormous, 750 m² health & spa zone, with heated outdoor pool with water jets and great sea views. The hotel restaurant Alameda XXI surprises with traditional and avant-garde fusion cuisine with a creative touch. You can choose from the gastronomic menu, the large gastronomic menu or à la carte dishes. Informal meals are served at the `Manhattan Wine & Lounge´, with cocktails and tapas on the terrace. Enjoy the Cíes Islands at your luxury hotel Nagari. Housed in a building dating back to 1768 that has maintained its rustic, original charm, this comfortable rural boutique hotel is nowadays one of the best places to stay. The hotel is located directly in front of the sea, on the outdoor terrace on the promenade you can enjoy a snack or a refreshment. 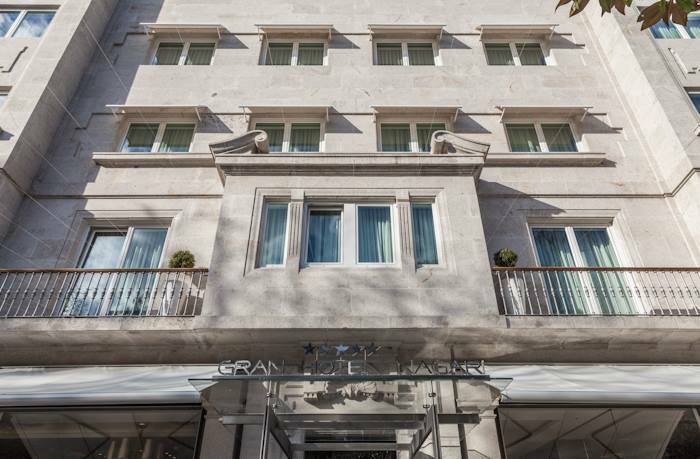 With 11 comfortable rooms, furnished in a classic and functional style. The hotel restaurant offers traditional Galician cuisine. `Baiona´ in the heart of the `Rías Baixas´, is an ideal starting point for various excursions in the surrounding area, a bicycle rental service is offered in the hotel. Book now your getaway in Pazo de Mendoza. 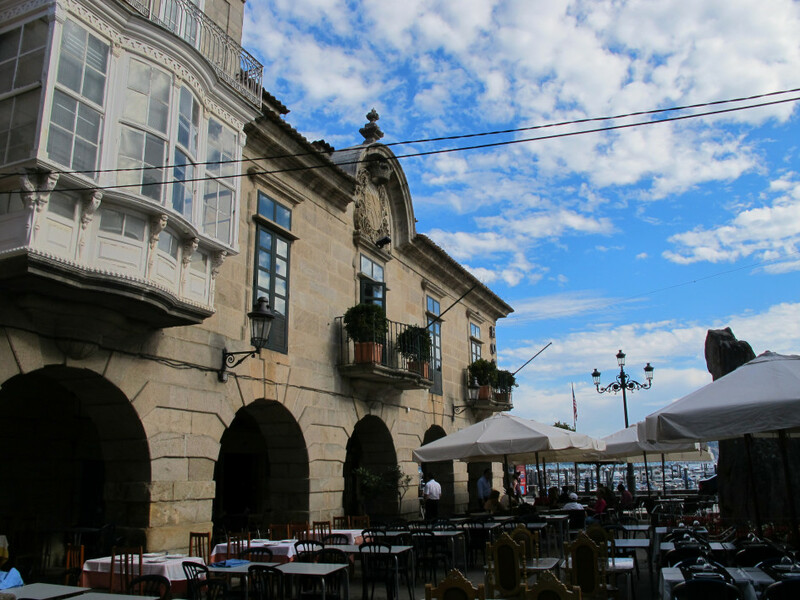 If you are traveling to Galicia, you should check out our Boutique Hotels in Galicia and Boutique Hotels in Pontevedra.